Stand–up comedians are a rare bunch. Their skills are unique, crafting their material as they travel from city to city, theatre to theatre. Out there all alone on stage every night, working without a net, just talking—and loving every minute of it! Sometimes they even do their best stand up while sitting down. Stay with me here. This summer, three of the best stand-ups in the business will be appearing at American Music Theatre: Bill Cosby, Bob Newhart, and Jay Leno. A total of almost 150 years of comedy experience between them! 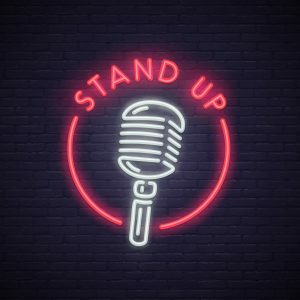 Although all three are well known and loved for a laudable list of sitcom characters, movie roles, Tonight Show appearances, books and comedy albums, one thread remains—it all began with stand-up. William H. Cosby Jr.—“Cos” to his friends, is best known to many as Dr. Heathcliff Huxtable from the Cosby Show. His true beginnings, however, were in stand up. He began his comedy career in Philadelphia nightclubs, while an undergraduate at Temple University. It was there he began to weave the countless stories of his younger brother Russell, Fat Albert, and his hilarious “Noah” routines from the album: Bill Cosby is a Very Funny Fellow Right! Later, parenthood and family life were his inspiration for stories like “Chocolate Cake for Breakfast,” from his brilliant concert video: Bill Cosby—Himself. Ironically, starting with this 1983 film, Mr. Cosby did some of his greatest stand-up—while sitting down! Bill Cosby’s latest concert film, now playing on Comedy Central says it all: Bill Cosby… far from finished. You can see his new stand-up (probably sitting down), the far from finished Tour, at American Music Theatre this September. Before he was a television icon, Bob Newhart thought he was pretty funny. He had a dream to record a comedy album. Turns out, the former accountant and copywriter, with just a few sample routines, had an album recorded and sold before he ever performed in front of a live audience. He had just about enough material for side one, so he had to develop the jokes and bits for side two by expanding his material into a stand-up routine, which he began to perform at nightclubs. That recording eventually became his classic debut album: The Button-Down Mind of Bob Newhart. Of course, he later became a TV psychiatrist, an innkeeper, and most recently, former science show host “Professor Proton” on The Big Bang Theory. He was also featured in the movie Elf. Like Cosby, some of Newhart’s best stand up work is performed while sitting down! Take a moment to revisit his classic “driving instructor” routine—better yet, come see him live at AMT in August! Considered by his peers as the hardest working stand-up in show business, Jay Leno never stopped doing stand-up—even as he sat down for 22 years behind the Tonight Show desk! Now with his retirement from the show, he has already returned to the road, heading out on tour. Jay Leno will easily transition back to doing stand-up. At heart, he always considered himself “a stand-up comedian with a day job.” Leno famously doesn’t drink coffee, soup or any hot beverages. If it doesn’t have ice in it, he’s generally not interested. He drank his first cup of coffee ever this year on Jerry Seinfeld’s webcast Comedians in Cars Getting Coffee. Jerry picked him up in a 1949 Porsche 356/2. An avid fan of cars and comedy, at least Jay enjoyed two out of three. Coincidentally, throughout their careers, Cosby, Newhart, and Leno each regularly appeared and guest-hosted the Tonight Show during the Johnny Carson years, while of course, Jay went on to replace Johnny in 1992. Here’s a clip of Jay Leno’s first stand-up appearance on the Tonight Show. AMT is lucky enough to be hosting these three legends of comedy this summer. Don’t miss your opportunity to see them live.